Amelanchier alnifolia – Saskatoon berries were the most important plant food used by the Blackfoot First Nations peoples of the Prairies. 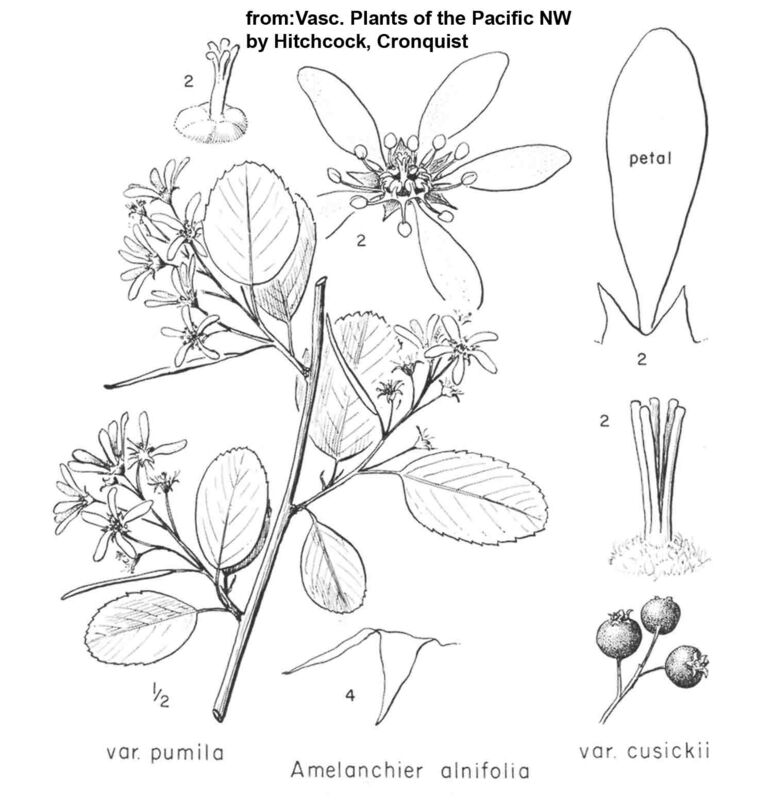 In Latin: Amelanchier alnifolia Nutt. Saskatoon is in the rose family. Rosaceae is the official family name, and this very large plant family includes apples, plums, cherries, and – of course – roses! This western saskatoon, Amelanchier alnifolia, usually grows to shrub-size. Leaves: Its alternate leaves are oval-shaped, about 2 cm – 6 cm (3/4 – 2 1/2 in.) long and slightly longer than they are broad. They are usually rounded at the tip and straight across at the base, with teeth at the upper edges. 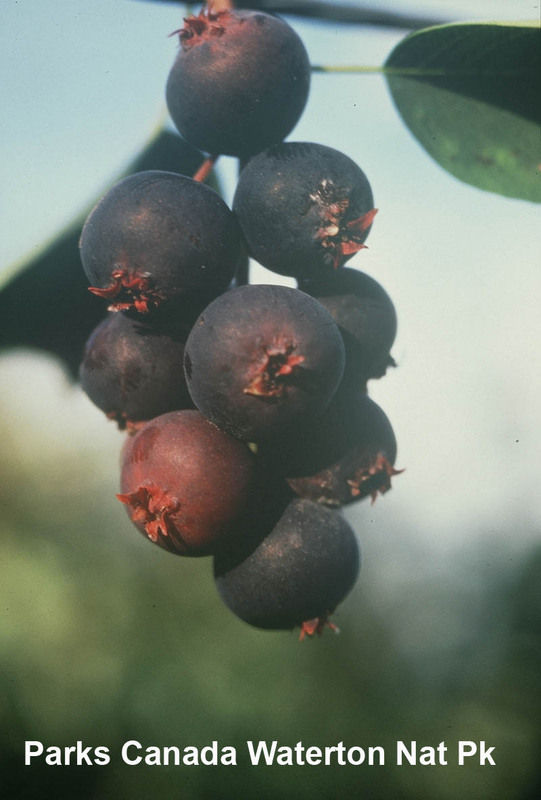 Shrub: The saskatoon, with edible berries similar in flavour to blueberries, grows in every province and territory in Canada, and across much of the United States. It ranges in size from a low shrub to a small tree – it can be a single stem less than 30 cm (12 in.) high or a clump of small trees over 6 m (20 ft.) high. The tips of young branches are reddish brown, but the older stems below them are gray. 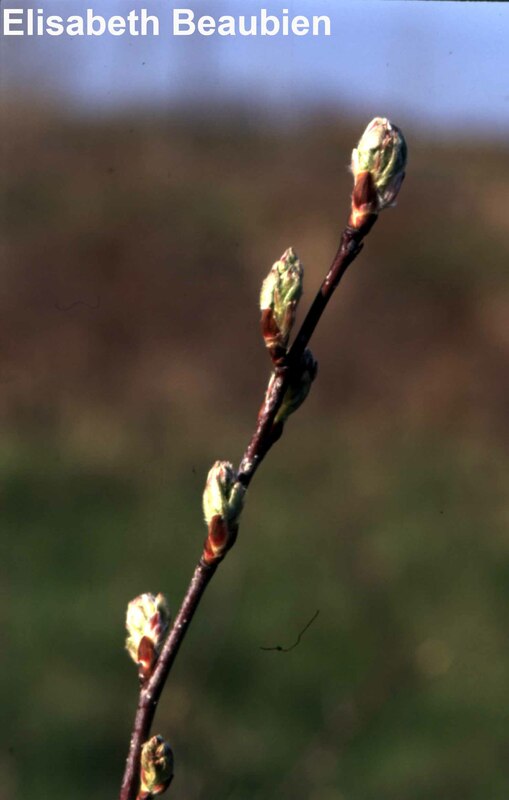 In winter, the buds have scales with small white hairs at their edges, and when the buds begin to open, downy-white leaf edges peep out. Flowers: Saskatoons, in any one area, usually flower over a two-week period. The tiny flowers (only 9 mm – 12 mm [1/3 - 1/2 in.] across) are snowy white, with five petals and 12 – 20 stamens. The flowers appear in a cluster, each cluster having 5 to 11 flowers. The flowers last between two and five days. The terminal flower and a few basal flowers open first, followed by the flowers in the middle of the cluster. In early summer, small groups of reddish purple to black berries develop from the flower clusters. 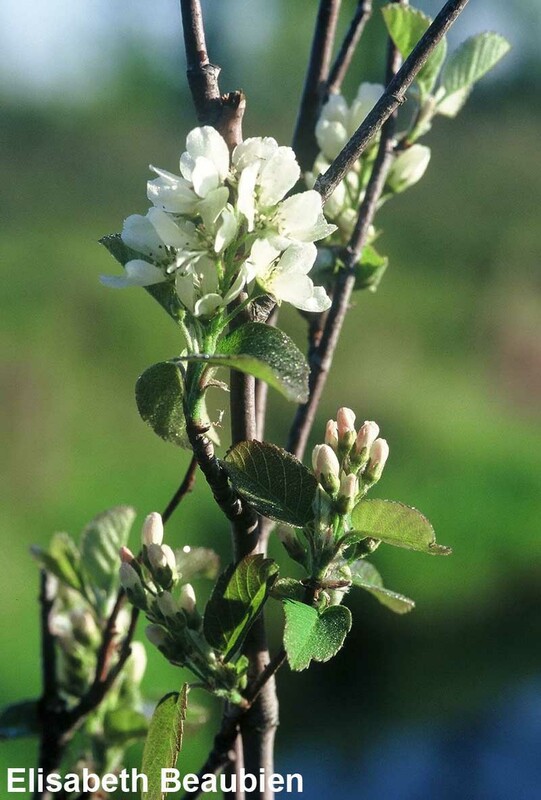 Amelanchier alnifolia (the western species) grows in several environments, including open forests and forest edges in the parkland, moist coulees and hillsides in the prairies and up to mid-elevations in foothills and mountain slopes. It prefers well-drained, often coarse-textured soils. Other saskatoons can live in wetter soils including stream or lake banks, bogs and moist woodlands. Moisture is a limiting factor for any saskatoon – this plant usually will not grow in areas with less than 350 mm (14 in.) of annual precipitation. Find a saskatoon shrub in a flat, exposed area if possible. Those bushes growing along the edges of the forest will get more sun and be more likely to flower. If a plant is found that still has dried berries from the previous year, it should produce flowers for your observation. Select and tag only a mature plant. Mark its number and location on a data sheet. First bloom: when the first flowers are open on the observed shrub (in 3 different places). Mid bloom: when 50% of the flowers are open on the observed shrub. Blooming time of the saskatoon is usually May or June, often before the leaves are fully developed. Bees and other insects that assist pollination are attracted to saskatoon flowers because of their white petals and sweet fragrance. Saskatoon flowers can self-fertilize, but when they are cross-pollinated by bees, more berries seem to be produced. The berries ripen in June or July, and each berry contains five to ten whitish seeds. The size of a saskatoon patch increases as the spreading roots send up new shoots – this addition of more shoots is called vegetative reproduction. In fall, saskatoon leaves turn yellow-orange. 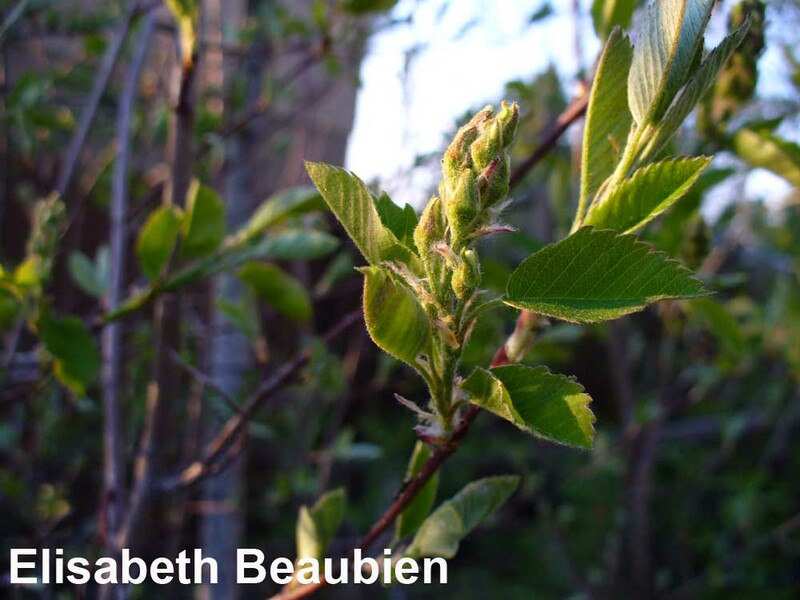 Deer, elk and moose feast on the tips of saskatoon branches in winter and enjoy the leaves in summer. Sharp-tailed grouse eat the buds in winter and spring. The berries are important fall and winter food for birds, who spread the seed in their droppings. Other animals that eat saskatoon fruit include bears, chipmunks and squirrels – these animals also help spread seeds via their faeces. Because saskatoon tends to grow in thickets it provides good wildlife habitat, providing cover for mammals and nesting birds. 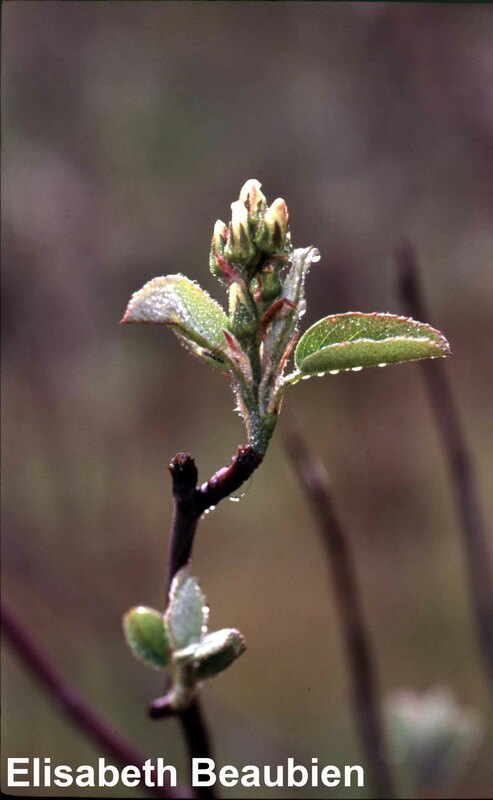 Amelanchier alnifolia grows most vigorously and productively as a member of a fire-successional plant community. Controlled burning can be used to promote and maintain extremely productive saskatoon patches. Most intensities of fire will kill the aboveground parts of saskatoon, but roots and underground stems near the soil surface will sprout, and the density of saskatoon shrubs appears to increase after fire. If the soil is moist, saskatoon can survive, through sprouting, even the most intense fires. The Cree name for this plant is “mis-ask-quah-toomina,” which early, white settlers shortened to “saskatoon”. Saskatoon berries were the most important plant food used by the Blackfoot peoples of the prairies. The fruit was used in ceremonies and the plant had sacred significance. Summer camps were moved to good picking locations, and berries were collected, dried and used in making pemmican. Arrow shafts were made from the hard, straight-grained wood. 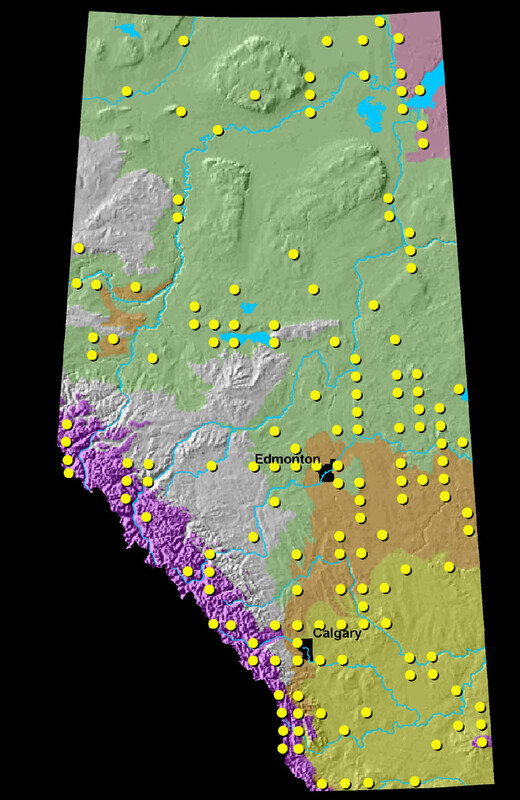 Saskatoon was also used in many medicines. For example, the berries were used to treat liver trouble and as a laxative, and the inner bark or roots were a remedy for diarrhea. Saskatoon berries were so valuable to First Nations Peoples in historic times that they were used as a trade item. Saskatoon berries are sweet and delicious, whether eaten straight from the bush or in favourite recipes like saskatoon pie. The berries are an excellent source of Vitamin C, manganese, magnesium and iron, and a good source of calcium, potassium, copper and beta-carotene. The content of protein, fat, and fibre is higher in saskatoon berries than in other fruits because the edible seeds are eaten along with the berry. Saskatoon is an excellent ornamental shrub for the garden. It is hardy; that is, it can withstand cold winters and drought, and is easily propagated, with fragrant, showy flowers, edible fruit and attractive fall foliage. It also attracts birds to a yard! Many different varieties have been produced from native saskatoons by horticulturists and fruit growers for commercial or garden use. If you would like to plant saskatoon in your yard, saskatoon plants are available from many plant nurseries, in several different sizes and varieties. Plants that are old enough to produce flowers are, of course, more useful for the Plantwatch project. 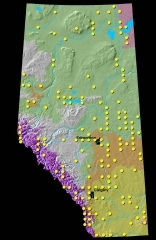 Saskatoons can be started in several different ways including from seeds, suckers, root cuttings, softwood cuttings, hardwood cuttings, cuttings from shoots, and crown division. 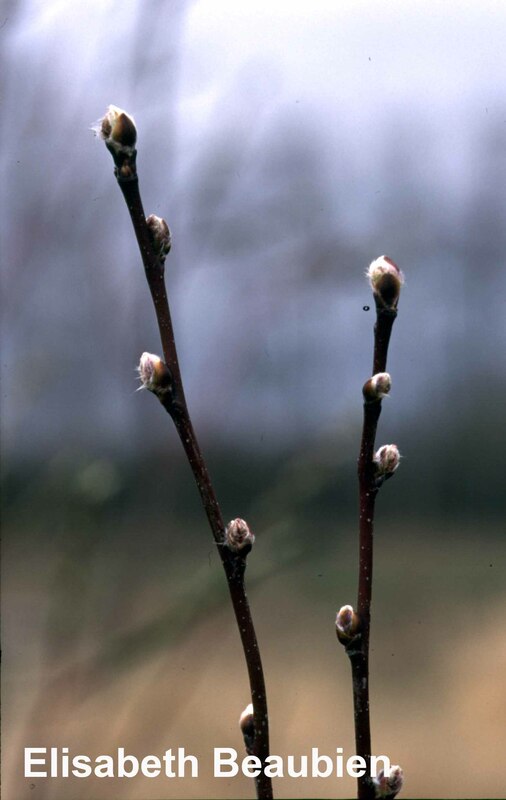 Saskatoon twigs can also be grafted onto other trees like apples and pears. When seeds are used, some of the plants grown from those seeds will be different from the parent stock. John Richardson / Franklin: Narrative of a Journey (1823) as cited in M.A. Downie and M. Hamilton. 1980. 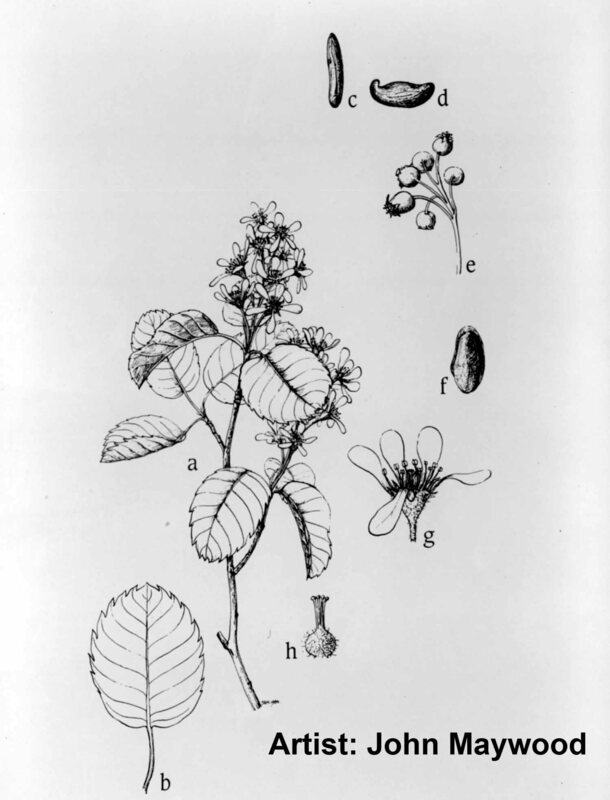 ‘And Some Brought Flowers’ – Plants in a new world. University of Toronto Press, Toronto, Ontario. In The North-West Passage by Land (1863) by Viscount Milton and Dr. Cheadle as cited in L.J. Clark. 1976. Wildflowers of the Pacific Northwest. Gray’s Publishing, Sidney, British Columbia. L.J. Clark. 1976. Wildflowers of the Pacific Northwest. Gray’s Publishing, Sidney, British Columbia. Couch, G.J. 1994. The use of growing degree-days and plant phenology in scheduling pest management activities. Yankee Nursery Quarterly. Fall. p. 12-17. University of Connecticut. -From an online publication on Integrated Pest Management, from Appropriate Technology Transfer for Rural Areas (ATTRA) in Arkansas. Clark, L.J. 1976. Wild Flowers of the Pacific Northwest. Gray’s Publishing, Sidney, B.C. Downie, M.A., and M. Hamilton. 1980. ‘And some brought flowers’ – Plants in a new world.University of Toronto Press, Toronto, Ontario. Farrar, J. L. 1995. Trees in Canada. Fitzhenry & Whiteside Ltd., Markham, Ontario, and the Canadian Forest Service, Natural Resources Canada, Ottawa, Ontario. Johnston. A. 1987. Plants and the Blackfoot. Lethbridge Historical Society, Occassional Paper No.15. Lethbridge, Alberta. Turner, N.J., and A.F. Szczawinski. 1988. Edible wild fruits and nuts of Canada. National Museum of Natural Sciences (Canada) and Fitzhenry & Whiteside, Markham, Ontario. St. Pierre, R.G. 1992. Growing saskatoons. A manual for orchardists. Department of Horticultural Science, Horticultural Research and Extension, University of Saskatchewan, Saskatoon, Saskatchewan. 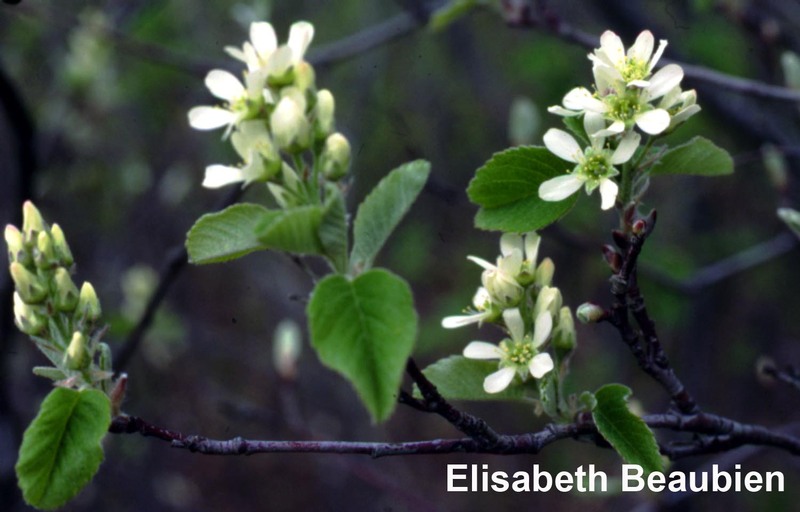 Thanks to Dr. Christopher Campbell, Biological Sciences, University of Maine, Bangor, Maine, for information on the flowering times of Amelanchier species.